A new joint venture with Ethiopian Airlines is taking off. DHL Global Forwarding signed a new agreement on Thursday to form a joint venture company, DHL-Ethiopian Airline Logistics Services Ltd., with the largest aviation group in Africa to build the leading cargo logstics provider joint venture company on the continent. The company will be based in Ethiopia, which will enhance the country’s logistics infrastructure and international trade connections. Under the partnership, DGF is now the first international forwarder to establish a local presence in Ethiopia, following the government’s recent decision to liberalize key sectors of the booming economy. 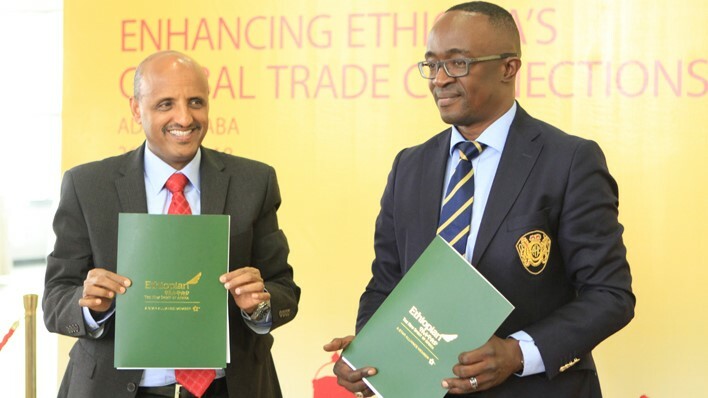 The joint venture will provide much-needed freight capacity and logistics infrastructure to Ethiopia, where soaring economic growth has rapidly driven up demand for international forwarding and handling services. The new agreement is another step in an already existing relationship between DGF and Ethiopian Airlines. In 2010, DGF has undertaken the maintenance, repair, and overhaul (MRO) operations of Ethiopian Airlines’ commercial segment – handling end-to-end customs clearance of essential items and ground transportation. These items are sent via air and ocean freight between Europe and Asia and range from aircraft parts – including engines and mechanical modules – to textile, utensils, food and beverages. Pramod Bagalwadi, a DHL veteran with over two decades of experience in management roles within the logistics industry, has been appointed to lead the new organization. This will be an additional portfolio for Bagalwadi, who currently leads the Industrial Projects Team for DHL in Sub-Saharan Africa and a strategic business partner for the company in the region. With the goal of offering door-to-door logistics services, the joint venture includes provisions for agricultural exports that currently support Ethiopia’s economic growth. The country currently generates revenue of more than $270 million in exports alone. Door-to-door solutions, including cold-chain services for life sciences and other temperature-sensitive industries, will also connect Ethiopia’s growing number of industrial zones and business parks, covering fast-growing sectors including pharmaceuticals, garments, and automotive production. In the midst of its five-year Growth and Transformation Plan, Ethiopia aims to establish at least eight more industrial parks and 2 million manufacturing jobs by 2025, in industries like horticulture, fashion and pharmaceuticals, according to the Ethiopian Investment Commission (EIC).